The Cheng Wu Innovation Challenge encourages IU Bloomington students to use technology in innovative ways to address compelling problems. Come up with an idea—it could be new technology or a new application of existing technology. Work on it. Apply. If your team is selected, you’ll pitch to a panel of judges—and you could earn funding that will help you develop your innovation. Want more information? Need coaching on your pitch? Contact Travis Brown at trabrown@indiana.edu. The final presentations for the 2019 Cheng Wu Innovation Challenge are on Friday, March 29, 2019, from 9 a.m. to 12 p.m. in Dorsey Learning Hall (Luddy Hall 1106). 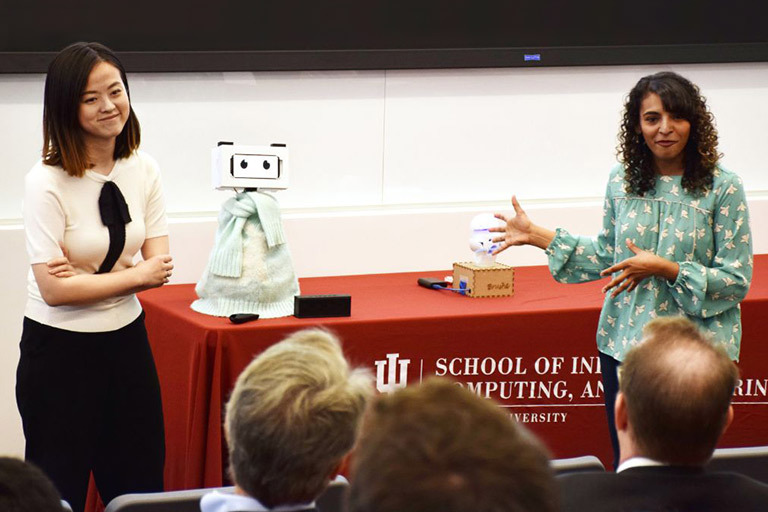 SICE master’s students Tingyu Li, left, and Pavithra Ramamurthy won first prize for “Buddy,” a robot that encourages children with cleft lip and palate to do speech therapy, in the form of storytelling, in their homes. A total of $15,000 is awarded. Often the first-place team receives $10,000 and the second-place team receives $5,000. The judges decide how the funds are divided. Each team member must be an IU Bloomington undergraduate or graduate student who is enrolled full time. Technological innovations developed for a course may be submitted. All intellectual property submitted for the purpose of the competition must belong to the students who are submitting it. By participating in this competition, you agree to receive any funding through your IU bursar account and to use the funding to support the further development of the technological innovation presented in the competition. The application for the 2019 challenge is closed. We will begin accepting applications for the 2020 challenge in fall 2019. IU technology experts review the applications. The top-scoring teams are named finalists and will present at the competition. SICE graduate and serial entrepreneur Cheng Wu established the fund that sponsors the challenge.